1. Preheat the oven to 200°C, gas mark 6. Mix the cajun seasoning with the oil, maple syrup and thyme in a large bowl, add the chicken and mix to evenly coat then leave for 10 minutes. Transfer to a roasting tin and cook for 25-30 minutes until cooked through with no pink meat. 2. Meanwhile, brush the corn with oil and place on a preheated griddle pan or barbecue for 10 minutes until charred slightly. Allow to cool. 3. Cut off the kernels from the corn and stir into the chipotle coleslaw. 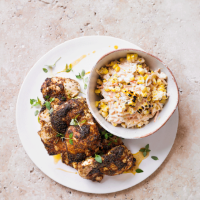 Serve with the cajun chicken, drizzled with the excess juice and sprinkled with extra thyme leaves.